Mobile phone repairing course in Hindi me aaj hum aapko chalte-Chalte bich me mobile phone Switch OFF hone ki fault ko solve krna sikhayange, Mobile repairing me kisi bhi hardware jaise display problems, screen touch, keypad, mic, speaker, ringer, dead mobile phone, short mobile pcb circuit board ki fault ko step by step follow krne se solve krna bahut easy hota hai. Kahi Baar mobile phone chalta chalta, pocket me padaa apne aap Switch OFF ho jata hai. Jab mobile phone switch ON krte hai to Mobile phone kibattery full charge hoti hai. Aaj ki post me hum learning karenge – chalte mobile phone ki switch off hone ki fault or problem ko solve krna. Mobile repairing in Hindi me aaiye jante hai Running mobile phone auto off problems solution in Hindi. How to solve running mobile phone switch off fault in mobile repairing in Hindi. Mobile phone not switch on fault solution in Hindi. Mobile phone not working problems Solution in Hindi. 1. Mobile phone ki setting me check kare ki mobile phone auto-on off setting ON hai Ya OFF. 2. Mobile phone ki battery ko check kare, Dekhe kahi battery loose to nahi. Yadi battery loose hogi to battery connector se proper trah se connect nahi hone mobile phone ko battery ka current nahi milega. Battery loose ho to packing lagaye. Battery change krke bhi dekhe. 3. Battery connector ki pins check kare. Pin broken ya pins per dirt hai to clecn or scratch kare. 4. Battery Connector loose hai to Resold kare or faulty ho to change kare. 5. Mobile Phone ki PCB circuit Board ko Wash krke clean kare. Notes: Hardware se fault solve na ho to mobile phone me software flash krke is fault ko solve kare. 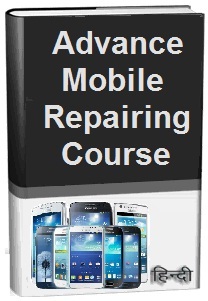 Mobile repairing course tutorial hindi pdf book software notes tips tricks guide online free download repair ebooks book in hindi.